Wednesday, 3 January, 2007 – Nick. 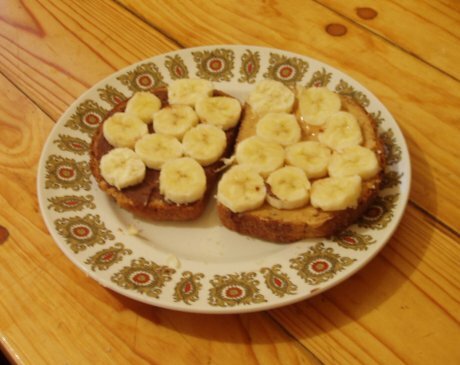 This is kind of a followup to my quick Peanut butter, banana, and Nutella sandwich post. Those who know me well would know that I like to experiment with food. Not in a creepy smother-spagetti-over-my-body-like-that-guy-on-Jerry-Springer sort of way though; I like trying to come up with new recipes. It can be pretty hit or miss… with a lot of misses. Here’s a quick recap of a few prior experiments. I’m sure there are more, but I can’t think of them at the moment. Day-old jok (Thai congee, savoury rice porridge) that has been kept in the fridge is incredibly gelatinous. So much so that I figured I could roll it into balls, coat these balls with flour, and deep fry them… and that’s what I did. It turned out very well (taste-wise, probably not health-wise). When eating jok I usually add soy sauce, deep-fried red onion, and vinegar chilli. This makes a great dipping sauce for jok balls! Conclusion: Victory! Probably more often called a float, a spider consists of a soft-drink (normally Coke) and a scoop of vanilla ice-cream. When mixed together, the result is a sweet, bubbly, opaque, milky masterpiece of dessert beverageness. Like many other things, I wondered if it could be improved by freezing. Apparantly not. Everyone know that spaghetti jaffles (toasted sandwiches) are the bomb. Jaffles are really like little pies with bread as pastry. So, what about a spaghetti pie? Short answer: it’s great! Conclusion: Victory! Update: Clearly the use of the word “cuisine” in the post title is tenuous at best! Unfortunately… probably around 30-40% bad.